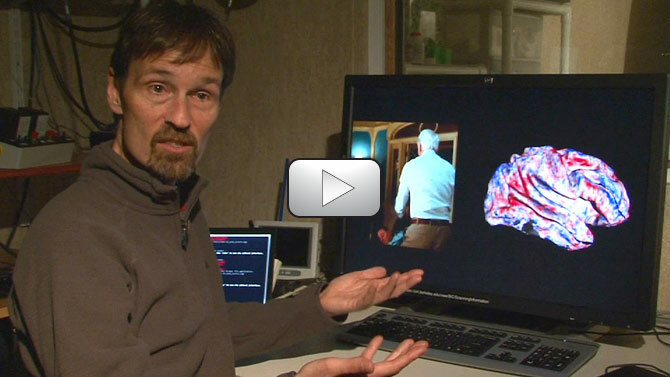 Psychology and neuroscience professor Jack Gallant displays videos and brain images used in his research. Video produced by Roxanne Makasdjian, Media Relations. BERKELEY — Imagine tapping into the mind of a coma patient, or watching one’s own dream on YouTube. With a cutting-edge blend of brain imaging and computer simulation, scientists at the University of California, Berkeley, are bringing these futuristic scenarios within reach. As yet, the technology can only reconstruct movie clips people have already viewed. However, the breakthrough paves the way for reproducing the movies inside our heads that no one else sees, such as dreams and memories, according to researchers. Eventually, practical applications of the technology could include a better understanding of what goes on in the minds of people who cannot communicate verbally, such as stroke victims, coma patients and people with neurodegenerative diseases. It may also lay the groundwork for brain-machine interface so that people with cerebral palsy or paralysis, for example, can guide computers with their minds. However, researchers point out that the technology is decades from allowing users to read others’ thoughts and intentions, as portrayed in such sci-fi classics as “Brainstorm,” in which scientists recorded a person’s sensations so that others could experience them. Previously, Gallant and fellow researchers recorded brain activity in the visual cortex while a subject viewed black-and-white photographs. They then built a computational model that enabled them to predict with overwhelming accuracy which picture the subject was looking at. In their latest experiment, researchers say they have solved a much more difficult problem by actually decoding brain signals generated by moving pictures. Reconstructing movies using brain scans has been challenging because the blood flow signals measured using fMRI change much more slowly than the neural signals that encode dynamic information in movies, researchers said. For this reason, most previous attempts to decode brain activity have focused on static images. “We addressed this problem by developing a two-stage model that separately describes the underlying neural population and blood flow signals,” Nishimoto said. Ultimately, Nishimoto said, scientists need to understand how the brain processes dynamic visual events that we experience in everyday life. Other coauthors of the study are Thomas Naselaris with UC Berkeley’s Helen Wills Neuroscience Institute; An T. Vu with UC Berkeley’s Joint Graduate Group in Bioengineering; and Yuval Benjamini and Professor Bin Yu with the UC Berkeley Department of Statistics.